What’s the future of coffee cups in 2019? There’s no denying that plastic waste, in all its forms, was at the heart of key environmental legislation in 2018. From beginning the Prime Minister’s 25-Year Environment Plan – outlining the Government’s target to eradicate all preventable plastic waste by 2042 and all avoidable waste by 2050 – to the Chancellor’s Spring Statement which explored the introduction of a “latte-levy”, and the launch of the UK Plastics Pact, it was a very active year for waste regulation targets and policy updates. And in 2019, this trend of putting disposables in the spotlight shows no sign of deceleration – English Dictionary publisher Collins has even selected the term ‘single-use’ as its Word of the Year. With a recent Government report highlighting how circa 2.5 billion disposable coffee cups are being thrown away per annum in the UK – and less than one in 400 are being recycled – it’s no wonder that there’s also been a lot of noise about in the media about bio-based alternatives and their valued role in shaping a new and more sustainable packaging era. Unfortunately, it’s not a simple case of black or white when it comes to the ‘why’ and ‘where next’ for the disposable coffee cup. 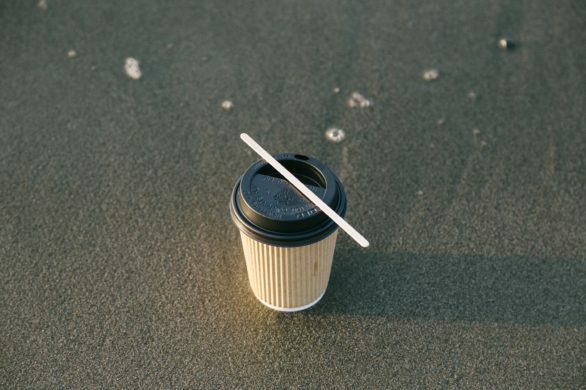 Last year saw a sea of response to remedying the single-use cup conundrum, whereby restaurants, coffee shops, canteens and offices throughout the country either switched to compostables or sold – in some cases, provided – keep-cups, offering a discount incentive to encourage people to bring their own re-fillable mug. With businesses having assumed more of an ethical responsibility for their packaging waste – either by choice or due to consumer demand – this trend is likely to continue permeating the corporate landscape throughout 2019. However, one of the crucial differences is that refillable cups are expected to overtake compostable ones. But why? Although bio-based packaging is a great substitute for the more ‘wasteful’ plastic cups, any current use of it is arguably just an illustrated example of greenwashing. That’s not to say that all businesses using compostable alternatives are doing so to wear an eco-friendly masquerade in the public domain – on the contrary. But, given that the UK doesn’t have adequate infrastructure to recycle and recover these items as their original design intends – and they often end up being landfilled or incinerated anyway – is there any gain from offering them in the first place? The fast-paced, cost-driven and convenient nature of consumerism means that a ban on these throwaway cups wouldn’t be feasible, as plastic is cheaper than its more ecological counterparts. So, what about plugging the infrastructural gap? Organic waste collections, coupled with combined anaerobic digestion and composting plants across all municipalities and councils, would be a utopian solution for half the battle. But, the public needs to recognise its pivotal role in how an infrastructural amendment can only prosper if waste is actively being segregated correctly in the first place. Otherwise, we will never evade the waste contamination cycle. With the number of coffee shops in the UK alone set to grow to 30,000 by 2025 – equating to 3.75 billion disposable cups – it’s apparent that the issue needs resolution. So, when it comes to what’s next for coffee cups, perhaps we need to trace it all back to how they emerged in the first place and ask ourselves what did we do before the coffee shop boom? Our on-the-go lifestyles won’t allow us to be sat at a table every time we indulge in a brew, so 2019 could be the year that a cup levy pays for the specialist bins and their collections, or maybe coffee houses should partner with the re-processors to co-own the recycling plants? One thing’s for certain, it should be the year that keep-cup usage thrives, helping to help make disposables more redundant and promoting a more circular – less throwaway – economy.